Item #47097 : Original era manufacture. 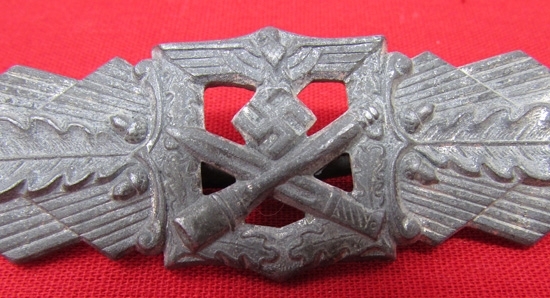 Zinc construction badge without a backing plate. There are traces of the original silver wash in the recesses of the front design, with a wide mounting pin on the reverse. Great silver blobs of solder at the base of the hinge and catch, perhaps Monday morning at the factory, or a new guy doing the soldering. 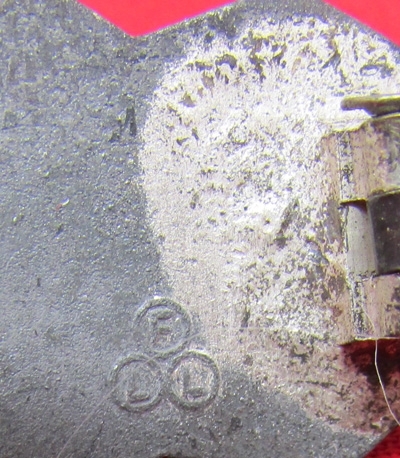 FLL markings can be see to the left of the hinge, and on the right, the words PEEKHAUS RLIN can be just made out to the right of the catch.While not the prettiest example of a silver Close Combat Clasp, it still is what it is.